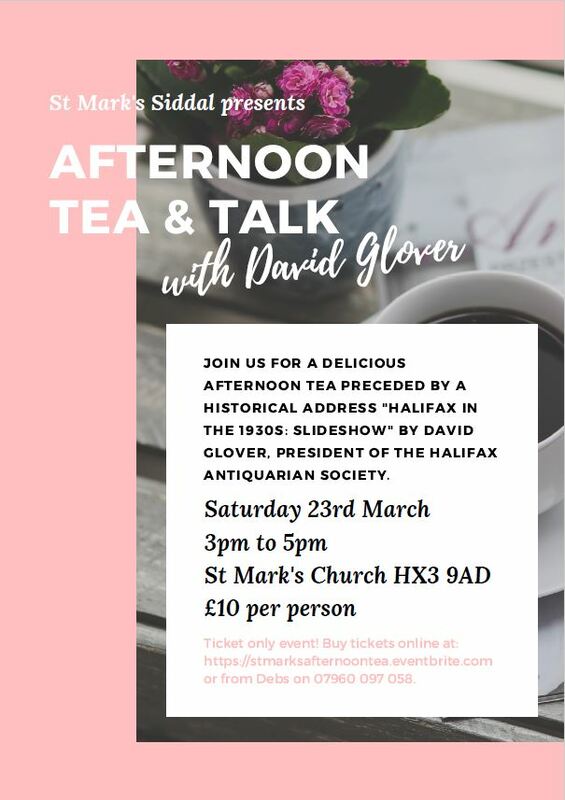 Join the folk at St. Mark’s Church, Whitegate Road, Siddal, Halifax HX3 9AD for a delicious afternoon tea on Saturday 30 March, 3:00pm-5:00pm preceded by an historical address ‘Halifax in the 1930’s :Slideshow‘ by David Glover. He will guide you through Halifax in the 1930s in a spectacular slideshow talk. Afterwards, there will be afternoon tea for all to enjoy. This is a wonderful opportunity to meet new people within our community and to learn more about the history of our town. Everyone is welcome, new and old friends, and everyone looks forward to seeing you! This is a ticket only event but you can buy tickets online for £10 through Eventbrite.